Ranger turned 10 last year. And this blog will turn 10 in August. But it took the publication of a book to make me realize I've been a parent to young children for 10 years. Though I helped Asha winnow down the hacks to include in the book, it wasn't until I held the final book in my hands that the story of my family using many of those hacks played out in my head. I'm not usually sentimental. When my kids started morning out programs, preschool, and Kindergarten, I usually celebrated their new beginnings when others might mourn the closing of a chapter. Maybe that's the gift of having more kids than hands, with each stage's ending I'm often quite thankful we all survived it. But when I flipped through this concise, lovely highlight of the ParentHacks.com blog, I felt the past-- struggles and successes-- as I remembered. With different hacks, I found myself remembering their contributors-- people like Jeremiah & Jenni from Z Recommends, Homa, AJ from Thingamababy, Anne Nahm, and Adjunct Mom. And Asha-- ringmaster, wizard of kindness-- was always there to encourage. I remember so keenly how she said that her second baby was easier than the first. These were my colleagues, inspirations, and co-conspirators who reminded me I wasn't alone-- even if was 3:30 in the morning unable to sleep after some middle of the night chaos. The memories- the shared revelations- the friendships. Suddenly, I saw clearly a community that encouraged and inspired. One of the earliest hacks I remember using was Sharpie-ing my phone number on toddler Ranger's belly for an expedition to the enormous Georgia Aquarium while I was whale-like pregnant with Scout. It sounds silly now, but I don't know that I would have had the courage to go alone without that hack. And when he scampered through a crawling under-aquarium viewing tunnel swept up in a mass of preschool kids, I panicked less- because we had a safety net. We had so much fun that day, and I don't know that I've ever told anyone this- I later realized that I'd written my HOME phone number for an empty house in Indiana on his belly. But we survived without incident- and maybe that was the greatest lesson of the day. When I got to page 210-- Uses for a Vinyl Tablecloth, I started to cry because illustrator Craighton Berman coincidentally drew my car in the hack. I don't know that the 2007 post showed enough of my car to reveal its overall shape, but to see the illustration show our car that carried my two oldest throughout their baby years just made me lose it. So mysteriously, incidentally, and curiously personal-- so much like my feelings for ParentsHacks overall. 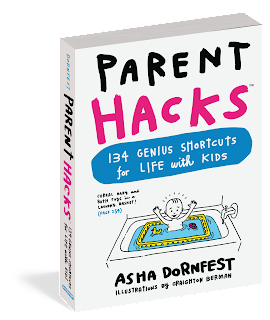 This new Parent Hacks book is a shining beacon of 10 years of parenting creativity, compassion, discovery, and inspiration. It's like a master's class in surviving the chaos and challenges with a sense of humor, adventure, and fellowship. I am so thrilled that all the goodness is out there in a format that invites new people into the conversation. 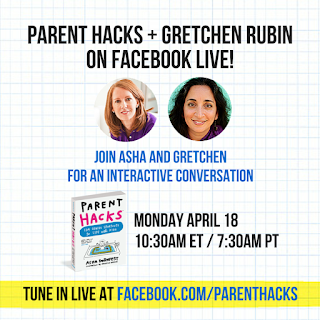 I'm also thrilled to see the conversation continue on the web site and throughout social media with the #parenthacks. Someday, I hope to sit down for tea with Asha and find the words to thank her for the warm, friendly space she created for all of us in the trenches. May you also find new joy, courage, and inspiration (and/or old memories) in this marvelous book. ***Baby Toolkit is the ongoing chronicle of a Hoosier family with the good luck of great communities of friends and mentors. 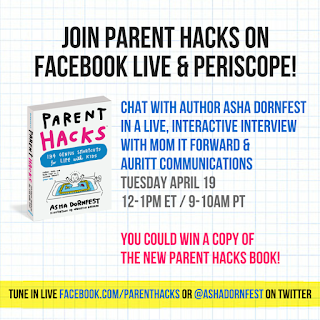 Adrienne did help with a very early editing of the Parent Hacks' book, but my opinions here are unprompted and uncompensated. We are Amazon affiliates, so a portion of purchases there after using are links goes to fund present and future Jones endeavors. What a lovely review, totally made me do the 'awww!' face reading it!